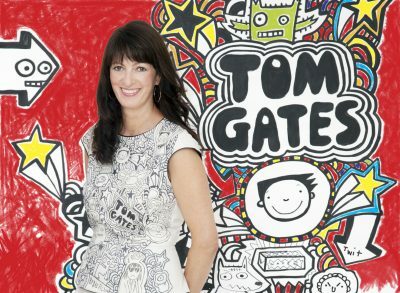 UK writer and illustrator Liz Pichon is the author of the ‘Tom Gates’ books for young readers, including the forthcoming Super Good Skills (Almost) (Scholastic, June). Pichon will visit the Sydney Writers’ Festival and Melbourne in May. Good news! Tom’s going on holiday! Bad news. Delia’s coming too. More bad news: And she’s bringing a FRIEND. There’s rain, pens, sticky notes and lots of doodles in the latest instalment, with pages for YOU to draw in too (if the book’s yours. If not, put the pen down). I’m editing and drawing like crazy so the only thing I’m reading is my own book. Curious: True Stories and Loose Connections (Rebecca Front, Weidenfeld & Nicolson). I love reading funny autobiographies and I heard a review today that was good so I’m going to get that. I often get asked for tips on writing children’s books, so I always suggest reading The Stinky Cheese Man and Other Fairly Stupid Tales (Jon Scieszka & Lane Smith, Allen Lane). It’s a wonderful combination of pictures, layout, text, humour and stories. I still have the collection of Aesop’s Fables illustrated by Brian Wildsmith—The Lion and the Rat (OUP)—that my sister gave me for my fifth birthday. I can remember thinking and feeling it was a very special book, even at that age. The colours, textures and the way the whole book is laid out really made an impact on me. Mary Poppins. I could persuade my kids to tidy up at speed and who wouldn’t want that handbag? I saw Matilda in the theatre and that was pretty special. If I was thinking about films that made an impact, I think it would have to be Chitty Chitty Bang Bang; the Child Catcher is the scariest character ever. All of the above and add audio too. Facebook for friends. Twitter for ‘chat’. STILL HERE and STILL BRILLIANT—if a bit more valuable.